The Independent: "Little’s playing had poise and purity of intonation, but it was curiously passionless, and she didn’t project her sound to fill the hall; up high, she was barely audible." The Guardian: Tasmin Little shaped the solo part beguilingly, though, and brought a real warmth to the lingering fade of the finale, but a bit more backbone ought to have come from the orchestra, and that might have defined the outlines of each movement more precisely. The Guardian: "The programme's outstanding performance came in the middle, with Isabelle Faust's intense reading of Bartók's Second Violin Concerto, vividly accompanied by Belohlávek and the orchestra, in which the soloist's complete technical command was offset by passionate engagement conveyed through rich and endlessly varied tone." TheArtsDesk.com: "German violinist Isabelle Faust conveyed the combination of the cerebral and rootsy in a nimble, vivid and fresh interpretation, which picked out the fine, lyrical detail of the score with precision and grassy-fresh phrasing, matched phrase for phrase by the Czech conductor Jirí Belohlávek’s tenderly precise direction of the orchestra." 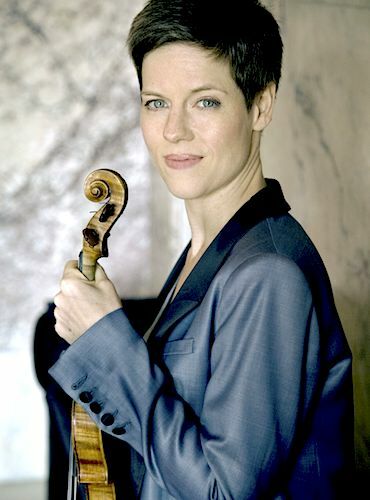 Music OMH: "Isabelle Faust was the hardy soloist in Bartók’s 2nd Violin Concerto, delivering a reading that was at turns virtuosic, meditative, and technically assured, transporting the listener into the composer’s vivid and original sound world with aplomb." The Independent: "Bartok’s aim with his second violin concerto was...to prove that 12-tone music could still be tonal – and as soloist Isabelle Faust brought to it her usual flawless accuracy and golden tone; the chaste beauty of her encore, a Bach Sarabande, completed the spell." BBC.com: "Prokofiev says he wanted to convey a broad picture of what was happening in 1914 - a year he describes as 'the end of the old world, the old ways, the old hierarchies.'" Daily Express: "'...I think I have finally found my own voice as a composer and I hope people can hear the Russianness in my music,' (Prokofiev) adds. 'My grandfather composed music that has a dialogue with the public and that’s what I want to achieve.'" The New York Times: "Mr. Shaham brought glowing sound, subtle shadings and effortless technique to his performance." New York Classical Review: "The first thought that comes to mind seeing over 100 teenagers dressed in red pants, blue blazers and white shirts on the stage of Carnegie Hall Tuesday night, was: 'How can anyone think classical music is dead?' There’s never enough money — there never has been — but money is neither alive nor musical. These kids were there to play a concert of classical music, and a good number of them, if not all, will continue playing classical music through their lives." The Boston Globe: "Shaham has the subtle technique to project the harrowing intricacies of this score, but his feeling for this music’s larger expressive arc, its grammar of burning tension and release, was less apparent, so the concerto even in his capable hands never really added up to more than the sum of its parts." Chicago Tribune: "...his account of Max Bruch's First Violin Concerto was unruffled and pleasingly worked out, with not a bit of rough tone or heightened tension. Few would call it distanced, but a difference was noticeable between Bell's lacquered perfection and Conlon's more shaded orchestral contribution." The Age: "Sinkovsky is the real deal: a passionate and adventurous musician with a slightly overwhelming array of talents."